The Learning Garden doesn't condone lawns, but this lawn has been planted, sadly, as a part of a UCLA Extension class - we in the Garden are amazed that planting lawn, in this day and age, can be considered good horticulture practice. We will probably not have to sheet mulch this to get rid of it, but believe me, once this class is over, this bit of lawn will be compost! 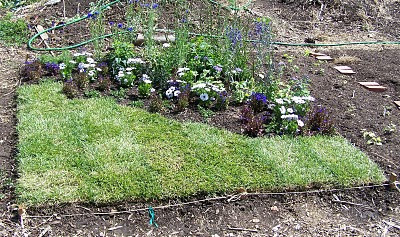 Sheet mulching is a technique anyone can use to kill off most of a lawn without herbicides. It's almost as easy as herbicide and, instead of introducing poison into your home's ecosystem, the dead grass actually will supply nutrients to the crop you eventually plant where your lawn used to live. In my world, first lay down three to four inches of compost/mulch (whatever you have on hand) before laying down the cardboard. Also water the site very well so the cardboard traps a good deal of moisture in the soil. Then I lay down my cardboard – and, as Ms. Black says, make sure there is no light getting through – overlap the cardboard pieces like crazy. Then cover with mulch for aesthetic reasons. Unlike Black, I have had good luck with newsprint, although, it has to be many, many sheets thick and overlapped as well. I have heard that people wet the newsprint as they put it down, to hold it in place as they put it down (wind will make a disaster out of newsprint in one bright flash), which I see as more make-work than I care for. I like to keep a wheelbarrow of mulch handy and throw a few hand-fulls of mulch on the sheets before they can blow away. This has worked well for me, as long as I did it, but when volunteers have used newsprint, it hasn't worked so well – I think they just don't lay down enough. At a minimum, I'm thinking 10 pages or so over every part of the lawn. This method works best with an actively growing lawn. It requires the grass to be active and growing in order to exhaust it's reserves. Remember that Bermuda stolons will hide under sidewalks – those areas that are adjacent to sidewalks will need special attention. I have dug a trench alongside sidewalks and lined it with cardboard placed in vertically to prevent those roots from re-infesting your garden. Sheet-mulching is easy and effective. The main drawback is that most of us want our gardens planted and producing yesterday. Too bad that attitude is not very gardener-like. A garden takes time and love and really doesn't come into being until the fifth year or so of planting. And no matter how good of a gardener you are, it will take several years for you to acclimate yourself to any new garden site. That's not a bad thing, but it rubs most folks in our society the wrong way - which is why we are so apt to use poisons and employ gas-powered tools to make it the way we imagine it should be. Both of those methods kill the organisms in the soil and require a gardener to do a lot more work and spend a lot more money than was necessary in the first place. Relax! It will take time - allow your garden to flow from season to season. Stop trying to control it as much and begin to see yourself as one who helps the process along. Plants want to live and to produce. Try to stay out of their way and enjoy the process. It's a lot better for your peace of mind and your heart. I am one half of the party responsible for this installation. I take strong exception to the use of the word "sadly" in your blog. My instructor for this class gave us carte blanche to plant whatever we desired. My partner and I "happily" chose to include turf so as to make a complete installation. Our color scheme of blue and white is in recognition of the official school colors of Venice High School, my alma mater ('78). Over the past weeks we have received nothing but compliments on our project. Natural turf provides a comfortable resting place for both body and soul. 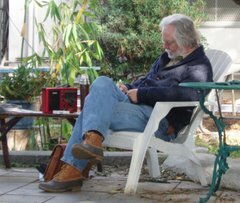 In fact, I have a picture of someone who found our lawn so inviting that they decided to take a nap right there. Even your own dog has been seen on numerous occasions taking full advantage of the cool texture. The Learning Garden has plenty of room for all kinds of horticultural decisions and practices. It is by its very name a place of instruction and as such should honor and embrace all viewpoints which are at the heart of any real place of education. I stand proud by the choices I have made, knowing full well they have inspired others and will promote a healthy dialogue so crucial to the exchange of ideas. Thank you for your comments. First of all, I think your design is lovely and find it a lovely spot to be and I think you have done a lovely bit of work. However, there are numerous other choices that one could make, other than turf, that would have served as well. The water we use in Los Angeles is pumped to us from other places, often at the expense of other ecosystems, and now it is being taken from those who grow our food. Growing lawns ought to be banned in the Los Angeles basin(along with some other heavy drinkers) with only a few places set aside for public ball fields or a park or two. Carex praegracilis is a California sedge that would serve beautifully in your design at a tenth of the water and other maintenance. I agree, we at The Learning Garden, do have plenty of space to consider many different gardens, but planting lawn in Los Angeles is simply irresponsible, I am happy to honor and embrace other viewpoints, but I must ask you to appreciate the importance of your lawn over the viability of other ecosystems and the farms that produce the food we eat. I have written more on this at my other blog. It more incumbent on me to specifically point out practices that are harmful - I am no less vocal in my opposition to the use of chemical pesticides and fertilizers - and my position as educator holds me to a standard of 'authority.' I would be unable to be who I am if I were to accept harmful environmental activity as a normal part of gardening. You will note, also, I do not allow my dog to contribute to the blog - I find his tastes can run in circles (remember, this is an animal that eats from the compost pile! ).